Facebook vs Pinterest: Which social media platform is better at driving sales? Jewellery and social media come hand in hand as artisan online accessory and handbags giant Boticca have found in their latest marketing study: Pinterest vs. Facebook. With their fan base on Facebook exceeding 27,500 and their Pinterest followers at nearly 800 they seem to have a firm grasp over the social media channels that can really sell their brand and their products. With that in mind, the guys over at Boticca based their study on a sample of 50,000 visitors from each site from March 15th 2012 to April 15th 2012. What they were left with as some genuinely interesting marketing insights as to how a brand like theirs could be utilising social platforms, especially in terms of conversion. To make things clear and, because it is Boticca, stylish, they have produced this thought-provoking infographic that outlines some of the more interesting outcomes of their study. 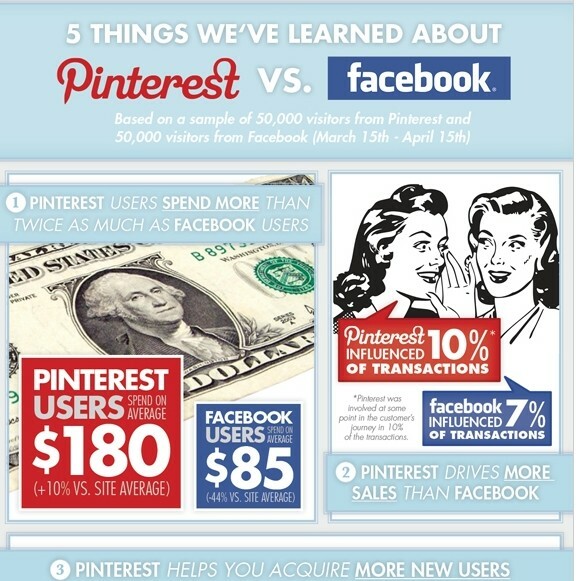 Facebook versus Pinterest: which social media platform is better at driving sales? According to online jewelry retailer Boticca, Pinterest is the big winner.